Grate 3 tablespoons zest and squeeze 1 tablespoon juice from the limes. Stir the sugar and 2 tablespoons lime zest in a small bowl. Stir the corn syrup and lime juice in a large bowl. Brush the tops of the pastry shells with the corn syrup mixture. Sprinkle with the sugar mixture. Stir the mint, rum and remaining lime zest into the remaining corn syrup mixture. Add the cream cheese and stir with a whisk until the mixture is smooth. Fold in the whipped topping. Spoon the whipped topping mixture into the pastry shells. 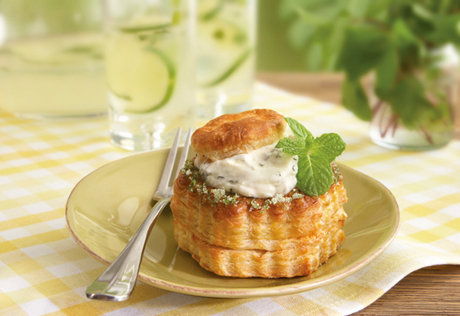 Top with additional fresh mint leaves, grated lime zest and the pastry tops.